TARPON SPRINGS — The city has been recognized for once again achieving Silver Level certification from the Florida Green Building Coalition’s Local Government Designation Program. On Dec. 11, Green Building Coalition Executive Director C.J. 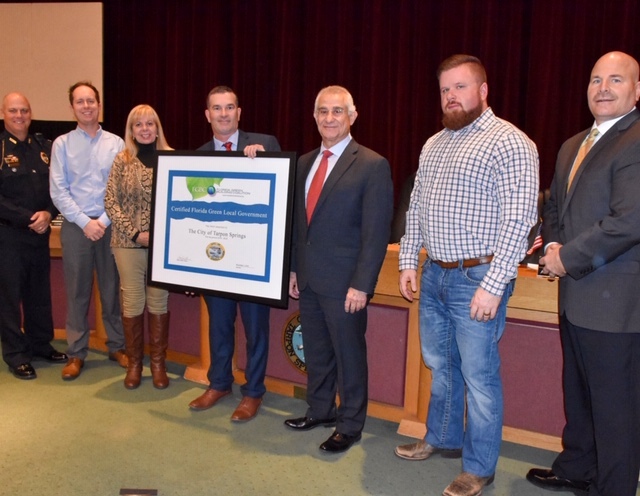 Davila presented city commissioners and other city officials with a giant framed certificate announcing the designation, which is awarded to communities that score high in program categories including energy efficiency, water, economic development, tourism and more. Maj. Jeffrey Young of the Tarpon Springs Police Department, commissioners Jacob Karr and Rea Sieber, Florida Green Building Coalition Executive Director C.J. Davila, Mayor Chris Alahouzos, Commissioner David Banther and Police Chief Robert Kochen with the Silver Level certificate Davila presented to the city. (Photo by Jeff Rosenfield). Davila noted that the city has been certified through the organization since 2013. He cited several key projects and factors that helped the city earn recertification. They include conducting an extensive energy audit, enacting a landscape and tree protection ordinance, developing post-disaster debris recycling strategies and the opening of a dedicated community garden. “Tarpon Springs has achieved 34 percent of all of our 300 points, earning them a Silver Level designation, and we thank Tarpon Springs for this achievement,” Davila said. After posing for a group photo, Alahouzos remarked on the city’s latest green achievement.